Is that armor for the player's character I see? I can agree with that, definitely. Hey Zack, if you could post a devlog of any big UI changes so far that would be a great treat to have as I survive this agonizing wait lol. Kind of unrelated, but I really like the 3 panel menu for breeding. I feel like I spend a lot of time in Siralim cycling through menus, creature stats in particular. Have there been any other changes/improvements in the way information is displayed? Mmm sounds much more interesting and rewarding then how breeding works for Pokemon. So that is going to be enjoyable to play with. 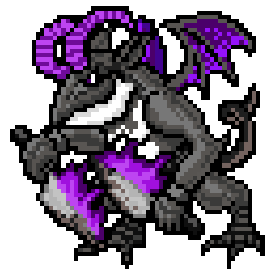 After you reach a certain realm level, your enemies will have Gene Strength as well. This is all communicated to the player at the teleportation shrine. For example, if you choose to visit a level 20 realm, the shrine will say something like "Enemies will be level 30 with 4 Gene Strength". Attaching that information to the Teleportation Shrine is a great idea!! In any case, the Breeding system looks like it will provide an incredible amount of content. Siralim 2 is looking to be a huge step forward from its predecessor. That looks like an insane amount of grinding since the parents disappear, making 'how to level as fast/efficiently as possible' a central goal of Siralim 2, am I wrong? A stark contrast to Siralim 1's 'levels don't really matter', can't wait to see how the balance between abilities vs stats vs spells works out in the end - by that I mean, really can't wait for the release, been skipping all other games in wait for this. For example, if you choose to visit a level 20 realm, the shrine will say something like "Enemies will be level 30 with 4 Gene Strength". Oh, that's nice! I don't really like hidden math-stuff (though you could use scrolls if you really wanted to know something, but meh). 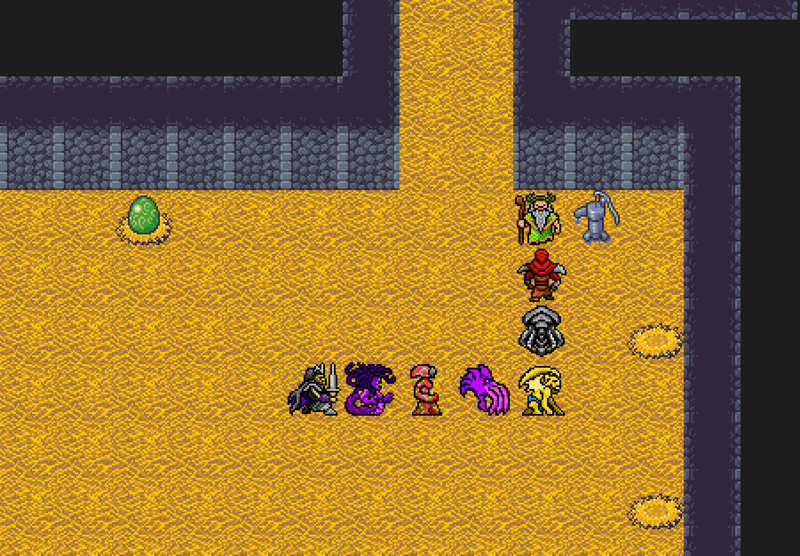 Leveling works just like in Siralim 1, so each level gives a percentage of base stats. The percentage is a bit smaller than in Siralim 1, though. Also, I really like the idea of making low gene strength creatures hatch immediately, but not high gene strength creatures. 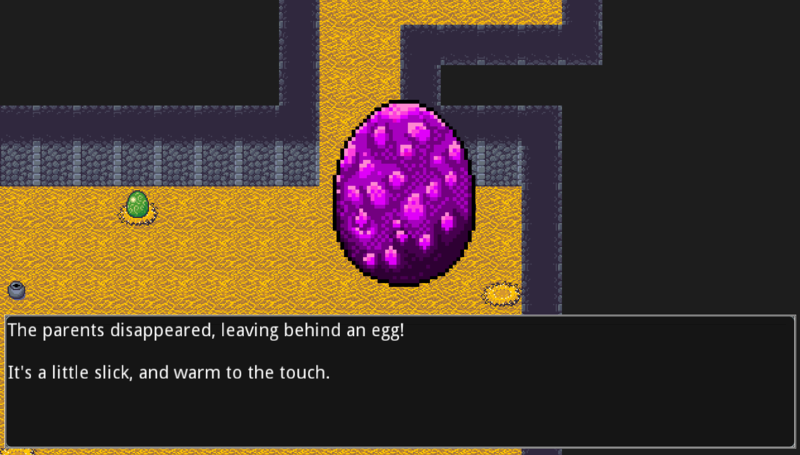 This means you avoid slowing down progress in the early game, but late game you force players to make interesting decisions about which eggs to hatch (since you can only have so many eggs active at once). I've already discussed breeding before, but now that it's fully implemented into the game, I can finally show off some screenshots and discuss exactly how it works. Alright, so first of all, creatures don't have genders. You can breed any creature with any other creature. I don't know how they pull this off from a physiological perspective, but let's not ask too many questions. Welcome to the breeding room and hatchery! This is where you'll breed your creatures and hatch the eggs they produce. If you want to breed, talk to the guy in green. If you want to hatch an egg, there are five nests in this room at your disposal, meaning you can hatch up to 5 eggs at a time. Yes, I named myself King AAA. You'd choose a lazy name too if you had to create a new character on a daily basis. As you can see, you have two main options: 1) choose the parents yourself, or 2) see which creatures you can create based on the breeding recipes you've discovered so far. As a reminder, breeding recipes can be found by experimenting with unknown breeding combinations, by completing repeatable quests, or by finding them in realms. Let's choose the parents on our own. This interface is broken up into 3 panels. In this scenario, the first panel is a list of all the creatures in your party and in the stable. You can view the details of the highlighted creature in the second panel. I'll choose my Raptor Occultist to serve as the pedigree (or first parent) in this breeding process. Now we need to choose the mate. This step is similar to the first one. Right now, we're just trying to choose a parent to breed with our Raptor Occultist. I'll pick the Gorgon Sorceress. It looks like we don't have a breeding recipe for this particular combination, so we have no idea what the outcome will be. If we already owned this recipe, the third panel would show the creature that would be produced along with its ability. Let's hope we get lucky! 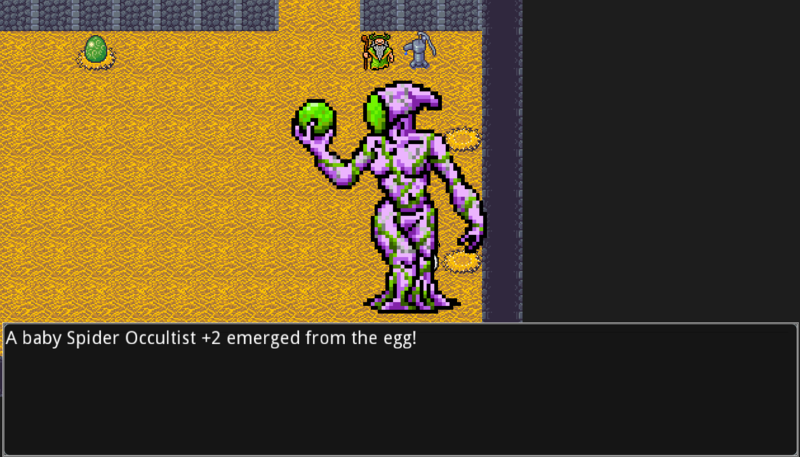 There's actually a short animation that plays before the egg appears where you can watch your creatures breed. And by that, I mean they move toward each other before you're blinded by a flash of white light. When you breed two creatures together, the offspring is always more powerful than either of its parents. This increased strength is denoted by a stat called Gene Strength, which is written in shorthand next to the character's name as "+X". For example, if our baby Spider Occultist has a Gene Strength of 3, we'd call it a Spider Occultist +3. This naming convention should be familiar to anyone who has played a Dragon Warrior Monsters game. 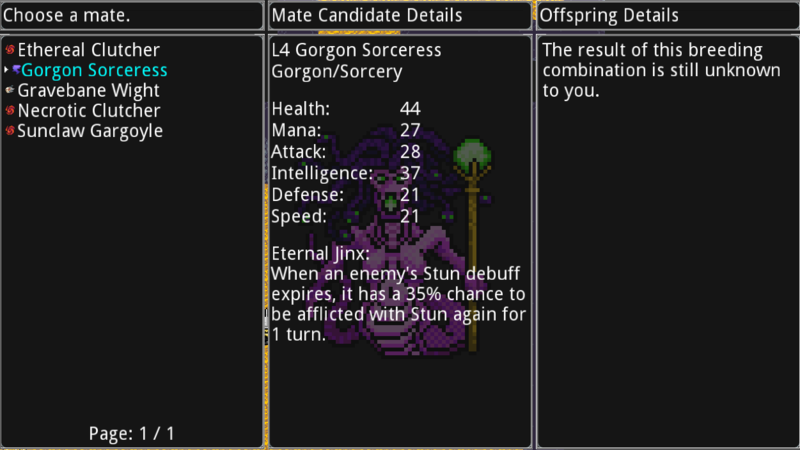 Gene Strength refers to the total amount of additional base stats the creature has. For example, if it has +3 base Attack and +2 base Intelligence, it would have a Gene Strength of 5. This isn't really important for you to remember, but I'm sure some people are interested in the exact details about how Gene Strength works. 1) Each parents' Gene Strength. 2) Each parents' level. If either parents' level is too low, the offspring won't gain as much Gene Strength from that parent. Anyway, now we have an egg, so let's take it to a nest and hatch it. Fortunately for our example, our egg only has 2 Gene Strength, so we don't need to pay any Power or complete a ritual. Again, an animation plays that shows the egg hatching, but I don't want to bog this post down with bulky GIFs. And there's our new creature! 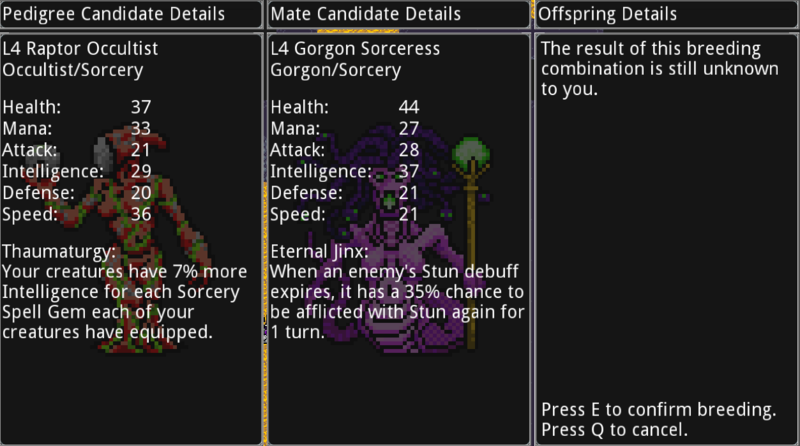 It has 2 Gene Strength, so its base stats are a bit higher than a normal Spider Occultist. This creature immediately joins my party, so now I can level it up and likely breed it with something else to obtain a new, even more powerful creature. Page created in 0.386 seconds with 55 queries.